RDF makes sure a free-range tortoise gets home each night. All this started two summers ago when my son came home with a baby tortoise that a friend could not care for anymore. We did a little research and found out that the main issue with keeping an African tortoise in Colorado is that they are solar powered and you have to watch the outside temperature. They are reptiles and have to be kept warm. So I have to add this disclaimer: I do not endorse keeping tortoises as pets in northern colder climates since they must stay inside for long periods in winter. The tortoise gets pretty antsy after a couple of days of being cooped up. We got the tortoise in summer and decided to let it wander outside in our well-fenced backyard during the day. The backyard consists of tall wild grass, which is only mowed once a summer — so we promptly lost the tortoise. After a long search, we found it again. 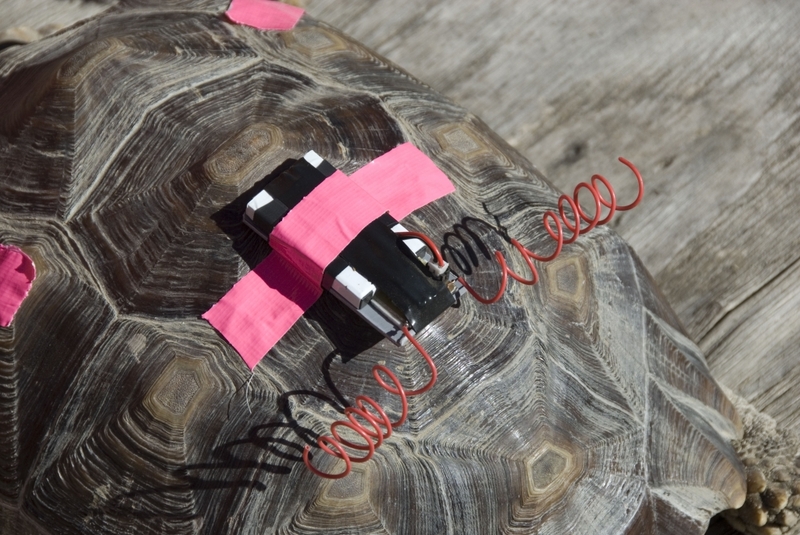 The next day we tried to be a little smarter — we stuck some pink duct tape to its shell so we could spot it easier. That helped, but not enough. We decided we needed to fence it in and made a small portable wooden fence. That met with only limited success, as the tortoise would escape from time to time. 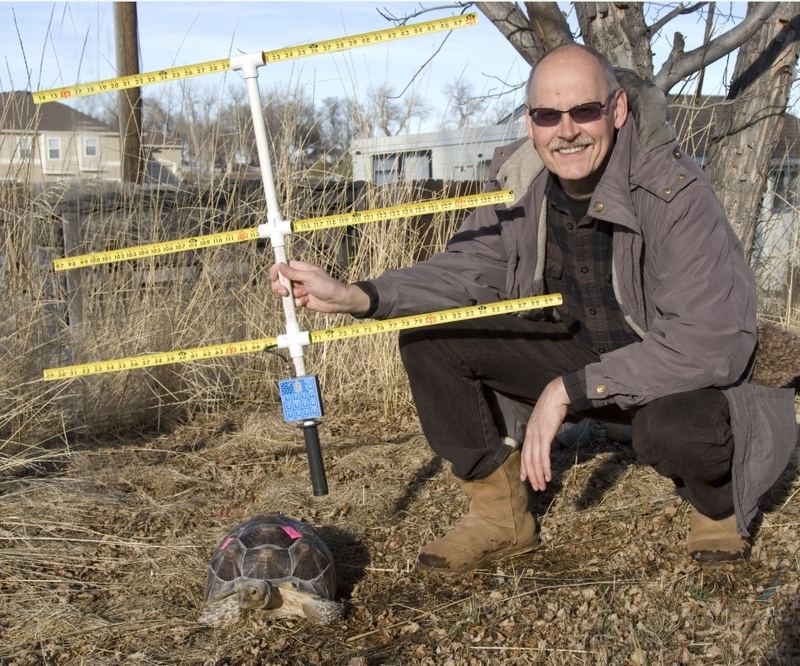 This solution was never acceptable to me, since it was ridiculous to fence the tortoise into 16 square feet if we had nearly half an acre of field where it could wander. Once, despite the pink duct tape, we could not locate it for 3 days while it was hiding in tall grass in the backyard. The Fox Is a Tortoise? After losing the tortoise, finding it, fencing it in, losing it, finding it — you get the picture — I decided we need a better technological solution. My thoughts went back to a time when my kids and I participated in casual fox hunting. I still had all the radio direction finding (RDF) equipment and I decided I could put it to good use. 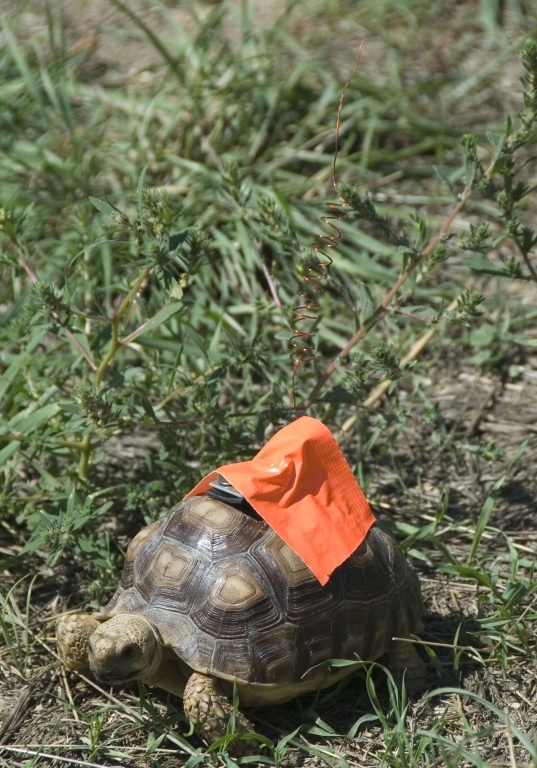 The first step would be to attach a small low-power transmitter to the tortoise that we could track. I remembered a very small wireless microphone kit I had that suited this requirement. 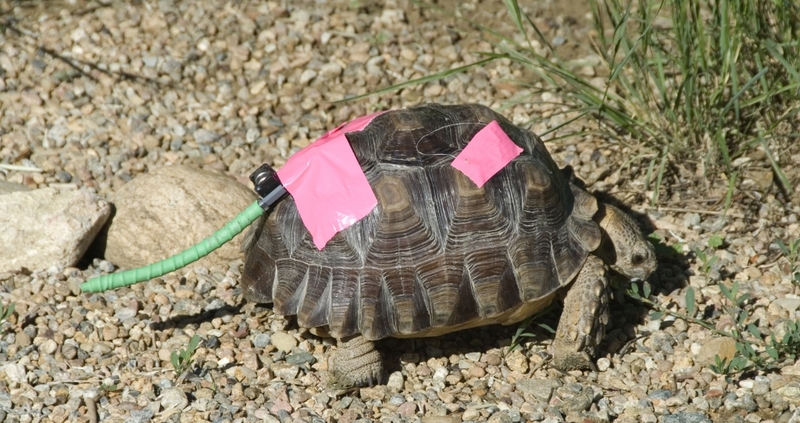 I took the little microphone board and stuck it to the tortoise with a 2 meter coiled-wire antenna, which solved the problem somewhat. I say somewhat, since we quickly found out that a tortoise is quite a stubborn animal. If he decides to go through an opening, he will try his best to do so. In the process, the radio might be left behind. I ended up many a time searching for him and only finding the radio in a bush. We quickly realized that we needed the orange or pink duct tape as a backup. We also had several incidents where we found the coiled antenna more or less straightened out after it got caught in some brush. How fast is a tortoise? — Faster than you think! How well is a tortoise camouflaged? — Better than you think. Where does a tortoise go? — Where it wants to. Using the wireless microphone as an RF source had a useful side effect. The microphone was very sensitive so you could hear yourself approaching in the audio on the direction finding (DF) receiver, which made the last 10 feet or so very easy. The little radio worked well and I could find it easily with any of my DF units, but it used button batteries, which did not last long and became expensive. Before I came up with a better battery solution, the batteries died and at the same time the tortoise lost the radio. We found it a week later, but the moisture took its toll and it was dead. I had plans to resurrect the radio, but realized that with my technical abilities it might take a while, so I investigated alternatives. Searching the Internet, I found a small low-power transmitter kit and since we are talking about a small area, low RF power is not a problem. This unit also ran on button batteries, but while shopping, I saw that RadioShack was selling out some Li-Ion batteries intended for an obsolete handheld game and picked them up for a couple of bucks instead. After a little soldering we were all set to go with rechargeable batteries having a charge life of several days. The new unit is very small — about 2.5 × 1 inch with the battery being most of that. It transmits CW and is very lower power. This did not work well with my NVARC FoxFinder and a tape measure Yagi or the old trusty BMG Engineering SuperDF TDOA (time-difference-of-arrival) antenna. The SuperDF was also a little bulky and I finally settled on using the VK3YNG Sniffer with a tape measure Yagi. Due to the low power of the transmitter I sometimes have to walk around the yard a little before I even start to pick it up — but even with that it usually takes less than 2 minutes to locate the tortoise. In summer we simply leave the tortoise outside and have an outdoor tortoise house with a heat lamp. After wandering around the yard the whole day, he is pretty good at coming back in the evenings and sleeping under his heat lamp. On the odd occasion when he decides not to come in, it is not a big deal since it is still warm enough outside. Through fall, winter and spring the radio has to be attached when he goes out, to be sure we can find him to bring him in at night. He tends to head for the nearest natural hiding place when he runs out of heat. We also always use the pink duct tape as backup in case he loses the radio. The 2 meter coiled dipole will break from time to time, but it is easy to solder a new antenna to the unit and I was able to RDF it with just one leg of the dipole still intact. The final problem, which did not have an easy solution, is the attachment of the radio. I stick the radio with duct tape in different positions every day to make sure the tortoise shell is evenly exposed to the sun for heat and to maintain a healthy vitamin D level. Unfortunately, some positions work better than others. The lower back seems to be the best, since it is in the lee of his shell. The only exception is when he backs into a bush to hide. When he comes out, the antenna will be all twisted up and tangled. Nature is helping with that problem since the surface area where I can stick the radio has been increasing over time. The tortoise weighed about a pound when we got him and he is close to 20 now. It is fun to do RDF again myself now that the kids are grown and have other activities. It also saves me a lot of time and worries if I can step out in the afternoon, grab the sniffer and Yagi and go and retrieve the tortoise. So it was ham radio to the rescue once again and I am having fun doing it. Photos by Sebastian Wessels, NSØW. Sebastian Wessels, NSØW, an ARRL member, was first licensed in 1991 in South Africa as ZR6BW, a call he still holds. He and his family moved to the US in 1996 and he used ZR6BW/WØ as a reciprocal call for about a year. He was first licensed in the US in 1997 as KCØCQQ and changed to vanity call NSØW in Sept of 2000. Sebastian and his wife, Hanlie, live in Longmont, Colorado and he works as a technical computer specialist at IBM. Their two sons Matthew and Peter are also licensed as KCØCWJ and KCØGOS, respectively. Sebastian’s primary interest in ham radio is HF ragchewing and chasing DX on 17, 20 and 40 meters. You can read about his current shack and operations at his website www.ns0w.com. He can be reached at 9447 Anhawa Ave, Longmont, CO 80503-9238, ns0w@arrl.net.